This is the major part of a Hathor capital that once crowned a colossal column in the temple of the goddess Bastet in the eastern Nile Delta city of Bubastis. 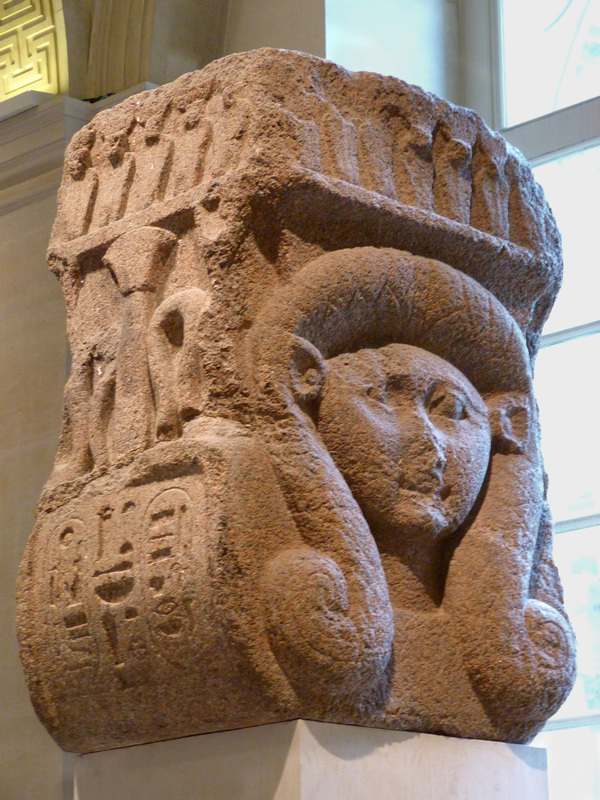 The column was one of four in a hypostyle hall adjacent to the great gateway decorated with scenes from the sed festival of Osorkon II. It was on the north side of the hall, a location indicated by the red crown of Lower Egypt on the heads of the cobras flanking the face. 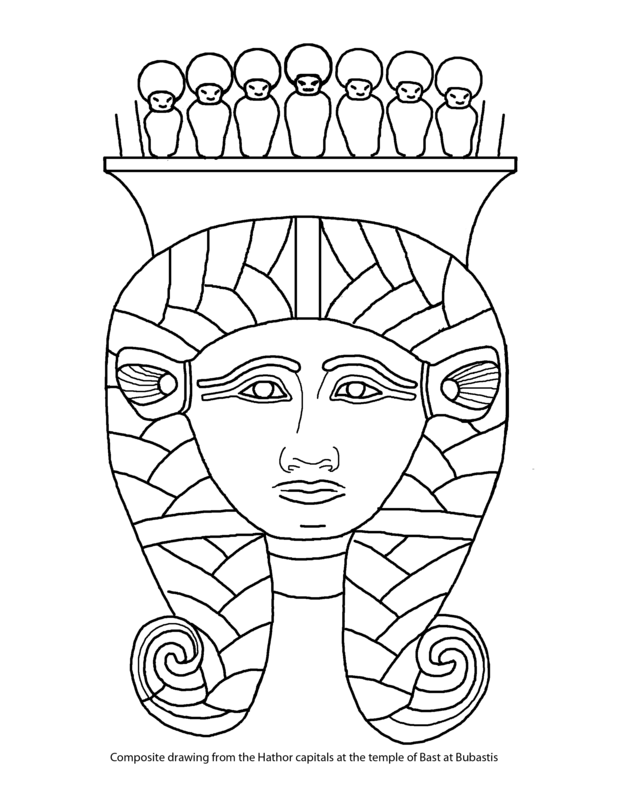 Behind the snakes were papyrus plants, also symbols of the North." The Boston museum's capital must also come from that same hall, based on the type of crown its snakes are wearing. And I found a fourth Hathor capital from the Temple of Bast! 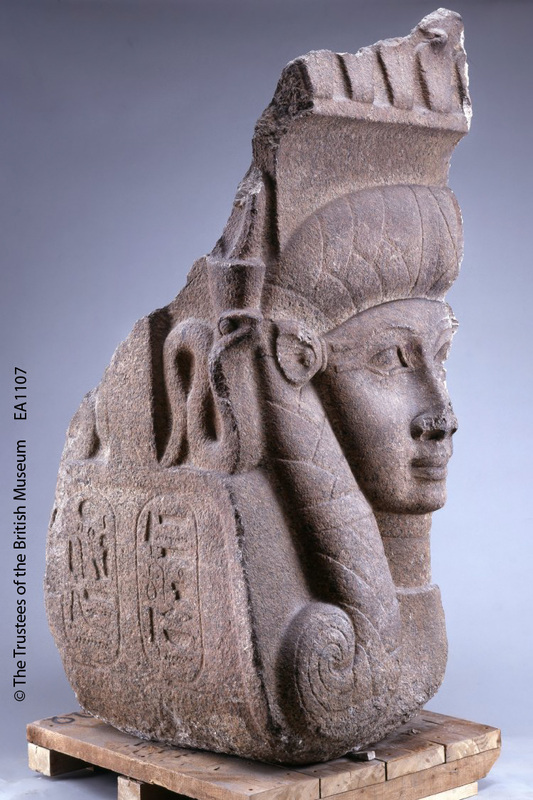 According to the Nicholson museum website, there are "eight Hathor capitals excavated at Tell Basta, also known as Bubastis. 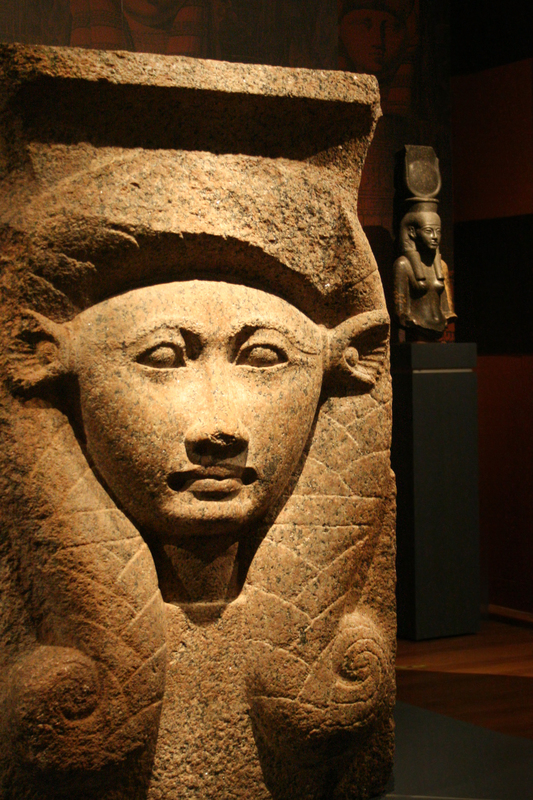 Bubastis was the cult centre of Bastet - the feline (cat) goddess who is one of Re's daughters. 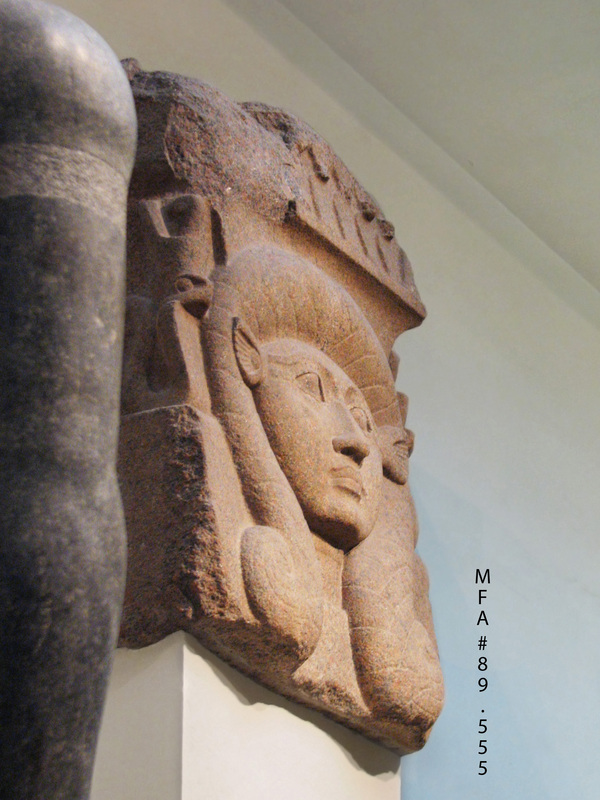 The broad face carved out of the capital is os Hathor - another of Re's daughters. 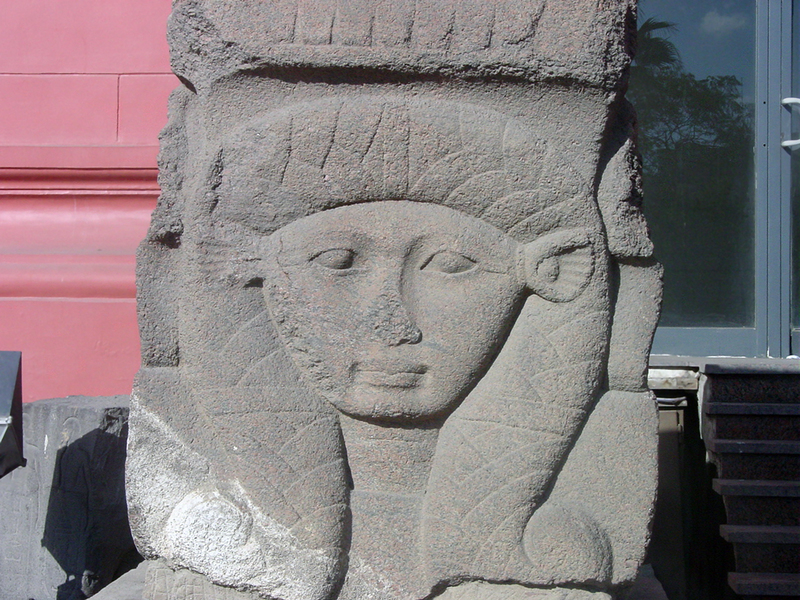 She is depicted with her usual bovine ears and thick hair falling in turned-up curls on either side of her face. According to the excavator of the site of Bubastis, traces of the original red paint remained on the lips at the time it was recovered." This one is different than the four from the north side of the hypostyle hall, in that it lacks the snakes and the papyrus scepter. 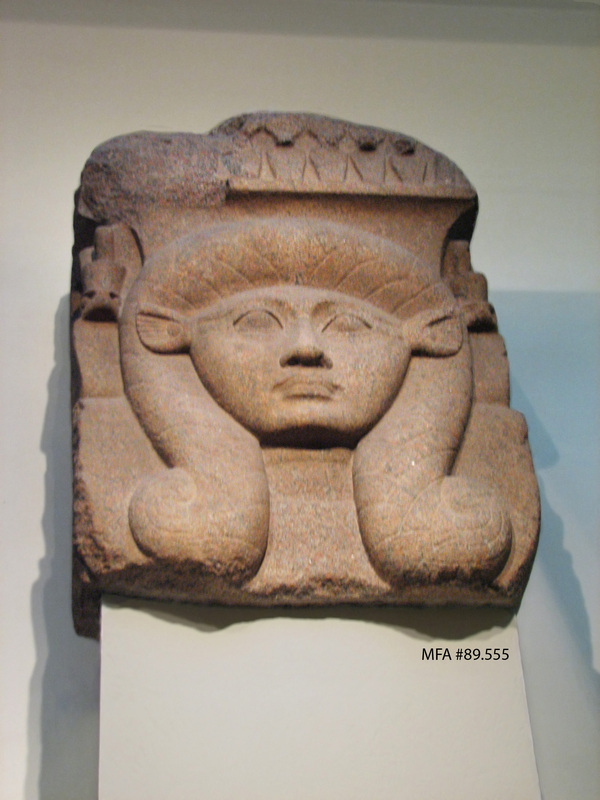 Yet the Hathor face is similar. In addition to these five capitals, Heidi Kontkanon recorded a badly damaged remnant at the Bubastis Open Air Museum, but poor thing, all that's recognisable is its eye and characteristic cow's ear. Arjunalistened's photo was most consulted as it is directly head on and has good detail. The capital at the Nicholson museum might not have had a row of uraei, the break is a very clean one. But the other three show seven uraei from the front view and the Louvre example shows five uraei from the side view, along with a papyrus scepter at the center and two crowned uraei on each side of the scepter, such that these two show from the front view. I opted not to include these side uraei in my trace. It's uncertain if the capital at the Nicholson museum had them originally. The curving side lines probably represent the curved lines in the sistrum as in Nebnefer's block. Nebnefer's cube is clearly from the 18th Dynasty, in the time of Amenhotep (Amenophis) III's reign (1390-1352 BCE), as it contains a rebus, "Beloved of Nebmaatre". Edouard Naville, who excavated the Bubastis columns in 1887-1888, thought these also did, even though today credit is given to Osorkon of Dynasty 22, reign of Osorkon, (874�2 BCE). Osorkon, like so many before him, might have simply usurped them. I'm inclined to agree with Naville. The mouths have that distinctive full Amenhotep look! Second head at the Brooklyn museum, third head at Chicago's OIM.